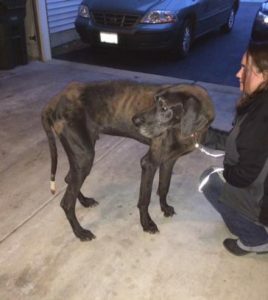 If you looked at Dolan, a Great Dane who three years ago was emaciated, homeless, and hopeless, you would not have thought that he’d go on to do great things. But after being taken in by Just Giants rescue, getting adopted by loving new parents, and joining forces with 1FUR1, he has gone on to make a difference in many lives as a therapy dog. To be exact, he brightens the lives of 60-75 seniors each month. 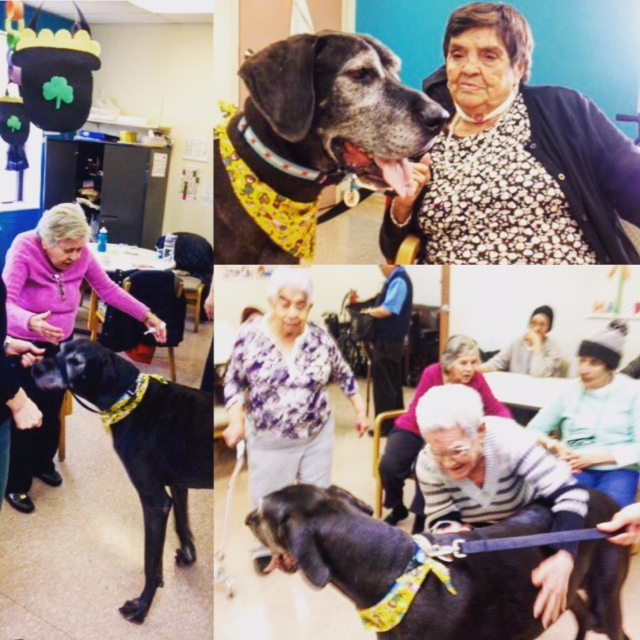 Dolan visits these elderly friends at the largest Hispanic social service agency in the Midwest. Many of the seniors don’t speak English, but are comforted by Dolan’s cuddles and gentle woofs. 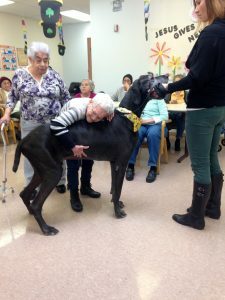 In fact, animal-assisted activities (AAA) like this program can provide health benefits such as decreasing blood pressure and heart rate while increasing stress-reducing hormones such as oxytocin, dopamine, and endorphins. 1FUR1 is celebrating our first full year of working with Dolan and his owner, Sarah, a healthcare professional living in Chicago. 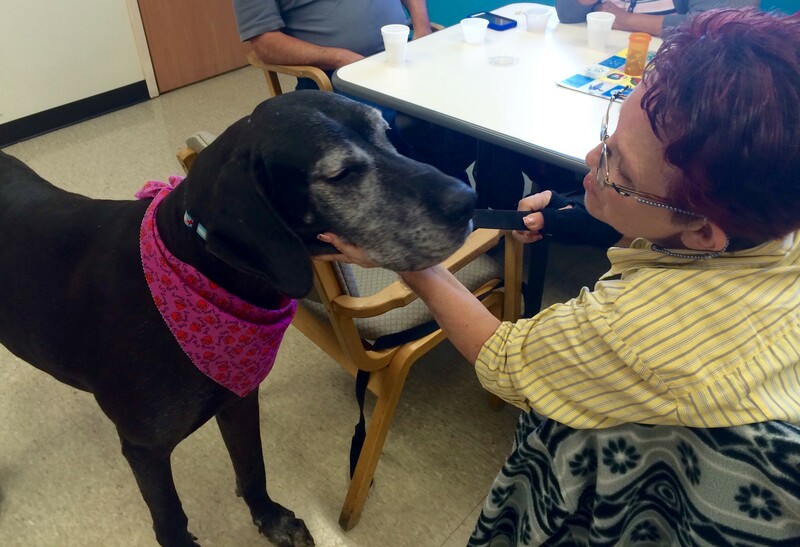 Sarah was always curious about animal-assisted therapy (AAT) and animal-assisted activities (AAA). For her graduate studies, she researched and wrote her thesis and dissertation about animal assisted therapy. After finishing her PhD, she knew she wanted to adopt a dog. She looked into local rescues and found Dolan, a 5 year old Great Dane. As an older pet, he came with some benefits you don’t get with a puppy. Fast forward two years, and Dolan has become an extraordinary pet and loving therapy dog to the local retirement home. During his monthly visits to Casa Central, he helps to improve the lives of at least 70 seniors in Chicago. Some people talk about their pets at home while others love to pet and dance with him. Dogs like Dolan help people suffering from loneliness, Alzheimer’s, and dementia. He is goofy, sweet, and patient – the perfect recipe for a therapy dog. He brings joy to those around him and we are truly lucky to have him be 1FUR1 Chicago Canine Ambassador. If you think your dog would enjoy visits to people at assisted living facilities, hospitals or retirement homes, remember a few tips. You and your dog should enjoy spreading joy. Assisted activity and/or therapy dogs are required to; 1) posses a natural predisposition to like interacting with various groups of people, 2) obedience training and 3) pass a test by a licensed trainer. You should also ask questions and get involved with us – 1FUR1 Foundation offers various volunteer opportunities. If you want to start a conversation about therapy dogs and learn more information, check out our articles in 1FUR1’s Animal Blog. If you are passionate about this, we would love to partner with you.